Indoor Vertical Gardens, Greenwalls, Bio walls, Live walls is an innovative way of bringing nature indoor. The Wall gardens occupy minimum space; and the concept of Vertical Gardens came into existence because of shortage of land in urban areas. Bio walls improve indoor air quality and it is observed that about 85% of pollutants are absorbed by indoor vertical gardens. It creates a perfect ambience for Restaurants, Hotels, Malls, Reception areas, Waiting Lobby, Residential buildings, Private houses, etc. Indoor Vertical gardens serves as perfect backdrop to convey a brand’s commitment to environmental friendly green practices. Green walls reduce the heat levels by upto 5 degree Celsius resulting in a cooler environment apart from increased sound insulation and absorption of indoor noise. The leak-proof, nuisance free system requires watering to be done once or twice in a week for 2-3 minutes. It is as simple as turning the tap on & turning it off after 2-3 minutes. Green branding: Green walls give your brand a green facelift. From covering your lobby with plants to an impactful entrance feature green wall. By using a vertical garden, you can show your company’s consideration towards sustainability. You can grow your own herbs in Indoor Vertical Gardens. 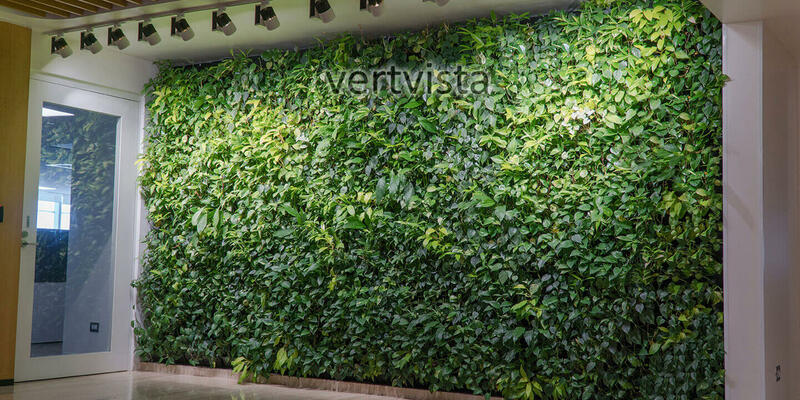 VertVista offers you a variety of indoor greenwall systems for Vertical Gardens across India. Our green wall systems are leak proof and all consideration is taken for zero post-installation challenges. VertVista has successfully built more than 25,000 square feet of Greenwalls in Mumbai, Surat, Jamnagar, and other major cities across, India. For each project a custom irrigation and automation system is planned resulting in optimum, efficient and smooth watering of plants for the years ahead. All irrigation material used is of international quality standards (Jain Irrigation or Hunter Industries). Our in-house team of horticulturists, installers, designers and engineers ensure customized soltuions with complete attention to details. The palette of plants is based on the design preferences and artificial lighting is used to ensure the plants get adequate light of their growth. VertVista has worked across India for institutions, MNCs, architects, developers, retail outlets and private home owners on projects of varying scales, delivering quality and timely solutions for each. VertVista is collaborating and working with the best practices in the field of indoor green walls and living walls. Green walls with a thickness of less than 100 mm, self-watering green walls, and green walls made from 100% natural and bio-degradable material are some of the avenues being worked on.